More and more software developers are building SaaS applications—cloud applications that serve a growing base of end customers. To efficiently and cost-effectively deliver this experience, developers need a customizable application platform, data isolation without the overhead, global distribution of data and content to end-users, integrated identity and access, and the option to easily embed business intelligence. Azure offers a unique set of fully managed Platform as a Service (PaaS) offerings, that deliver these foundational elements including: Azure App Service, Azure Service Fabric, Azure SQL Database, Azure CDN, Azure Active Directory, and Power BI Embedded. It is the only application development platform that delivers a comprehensive and integrated suite of fully managed services and is recognized as a Leader in Gartner’s Magic Quadrant for Enterprise Application Platform as a Service, Worldwide for the third consecutive year. Today, we are excited to announce two more investments that further enrich this experience for SaaS developers: general availability of SQL Database elastic pools and a partnership with Akamai for Azure CDN. These investments add to the momentum shared at //Build 2016 and together these services give our SaaS customers even more reasons to transform their solutions by leveraging Azure as their development platform. Prior to SQL Database elastic pools, developers were forced to make tradeoffs between database isolation and DevOps efficiency. Now, with the general availability of SQL Database elastic pools, in addition to the intelligent capabilities built into the service, developers can manage few to thousands of databases as one while still maintaining data isolation. Elastic pools are an ideal solution for multitenant environments as each tenant is assigned a database and each database in the elastic pool gets the computing resources only as needed – eliminating the complexity of developing custom application code or over-provisioning and managing individual databases to isolate data. Elastic pools include auto-scaling database resources, intelligent management of the database environment with insights and recommendations, and a broad performance and price spectrum to meet various needs. Since its preview of last year, many SaaS developers have adopted pools in their applications and are benefiting from the transition to elastic pools. One customer already benefitting from SQL Database elastic pools is GEP, a technology provider of SMART by GEP, a cloud-based procurement and supply chain solution. With the general availability of Azure CDN from Akamai, Azure CDN is now a multi-CDN offering with services from Akamai and Verizon enabling customers to choose the right CDN for their needs, streamlining support and service with Azure. CDN’s can improve speed, performance and reliability of solutions – a foundational requirement of SaaS applications. The stakes for today’s businesses and content delivery are high. All users—whether they’re online for business, consumer, or entertainment purposes—expect uniformly fast performance and richer media content on any device. In fact, 79 percent who have trouble with website performance say they won't return to the site to buy again (Kiss Metrics). With this release, Microsoft is offering customers flexibility and global coverage with the availability of Azure CDN from Akamai, a leader in CDN services for media, software and cloud security solutions, enabling customers to manage large media workloads in an efficient and secure way. In addition to the data isolation and data and content distribution provided by SQL Database and CDN, additional benefits can be unlocked when leveraging additional Azure PaaS services for SaaS applications. Combined with SQL Database elastic pools, App Service delivers a fully end-to-end managed app experience, something SaaS developers need to maintain sensitive margins. App Service is a one-of-a kind solution that brings together the tools customers need for building enterprise-ready apps around a common development, management and billing model. Customers can choose from a rich selection of app templates, API services and a unified set of enterprise capabilities including web and mobile backend services, turnkey connectivity to SaaS and enterprise systems, and workflow-based creation of business processes. Azure App Service frees developers to focus on delivering great business value instead of needing to worry about repetitive tasks such as stitching disparate data sources together and dealing with infrastructure management and operational overhead. This unified approach lets our customers take full advantage of the service while meeting their concerns about security, reliability, and scalability. For customers looking to build new highly scalable multi-tenant applications, Service Fabric is a mature, feature-rich microservices application platform with built-in support for lifecycle management, stateless and stateful services, performance at scale, 24x7 availability, and cost efficiency. Service Fabric has been in production use at Microsoft for more than five years, powering a range of Microsoft’s PaaS and SaaS offerings including SQL Databases, DocumentDB, Intune, Cortana and Skype for Business. In the largest of these, Service Fabric manages hundreds of thousands of stateful and stateless microservices across hundreds of servers. Now, we’ve taken this exact same technology and with it released Service Fabric as-a-service on Azure. For SaaS applications that require seamless federated identity and access, Azure Active Directory provides identity and access management capabilities by combining directory services, advanced identity governance, a rich standards-based platform for developers, and application access management. With Azure Active Directory, developers can enable single sign-on to any SaaS app developed on Azure. Azure Active Directory hosts almost 9.5 million directories from organization all over the world and 600 million user accounts that every day generate 1.3 billion authentications. Finally, for developers looking to transform the experience of their SaaS application, Microsoft recently introduced Power BI Embedded. Power BI Embedded allows application developers to embed stunning, fully interactive reports into customer facing apps without the time and expense of having to build controls from the ground-up. This service helps the end-user of an application seamlessly get contextual analytics within an app. Application developers can choose from a broad range of modern data visualizations out of the box, or easily build and use custom visualizations to meet the applications’ unique functional and branding needs. Power BI Embedded offers consistent data visualization experiences on any devices – desktop or mobile. Highspot, a SaaS vendor offering a sales enablement platform, is one early adopter of Power BI embedded. We’re excited about the general availability of SQL Database elastic pools and CDN from Akamai as they add even more value and choice to Microsoft Azure’s portfolio of services that help software developers transform their application development. By leveraging any of the Azure PaaS offerings, SaaS developers are free to focus on unlocking business value without the overhead associated with traditional approaches. Together these services give SaaS customers even more reasons to transform their business with Azure. 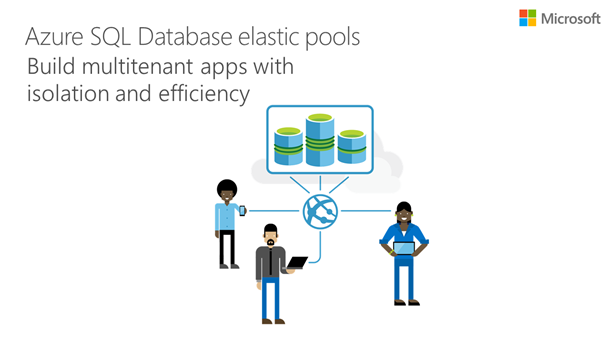 Visit the Azure SQL Database webpage to get started with SQL Database elastic pools. Visit the Azure CDN webpage to get started with Azure CDN from Akamai. Visit the App Service webpage, for an overview of App Service and view a discussion on the benefits of microservice architectures and microservice platforms in Mark Russinovich’s introductory blog post and video. Explore the Azure developer's guide to learn how to develop on Azure. Explore the Azure Active Directory developer's guide to learn how to integrate Azure Active Directory authentication in your SaaS application. Visit the Power BI Embedded to get started with Power BI Embedded.